Maybelline’s Urban Vibe contains lots of little pieces of orange and black confetti in a clear base, and it just screams halloween – pardon the pun! 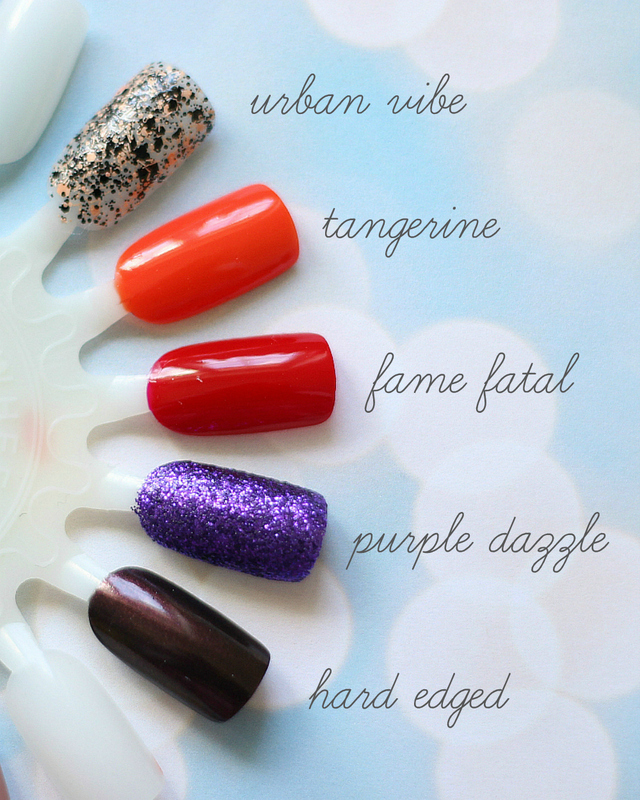 Now, W7’s Purple Dazzle is the one to go for if you want full on sparkle in a fun Halloween shade. A classic red is always a safe bet and is work appropriate. Stick to a simple, red creme like Essence’s Fame Fatal and you can’t go wrong. Alternatively, a deep, blood red shade would be an excellent choice. Want something a little brighter? Love pumpkins? I have the perfect, bright-pumpkin-orange shade by M&S called Tangerine, but this is discontinued, so try Barry M’s Satsuma instead. Rimmel’s Hard Edged is perfect if you are after a darker halloween look… This is a deep, shimmering burgundy that looks almost black in some lights. This shade makes me think of a decadent vampire’s lair, especially when the light hits it and highlights the green/gold tones in it.